“…Despite the acceptance of the six-point plan and the deployment of a courageous mission of United Nations observers to Syria, I must be frank and confirm that the plan is not being implemented. Mr. President, let me pause here and express my horror and condemnation at the fact that a new massacre of tens of civilians including children and women was perpetrated yesterday in Al Qubair, west of Hama. My heart goes out to the victims and their families. This took place just two weeks after the massacre in Houla that shocked the world. Those responsible for perpetrating these crimes must be held to account. We cannot allow mass killing to become part of everyday reality in Syria. 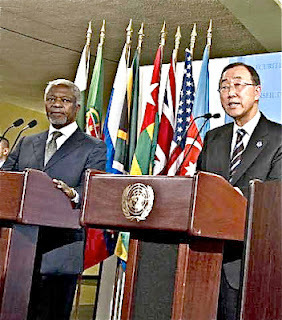 “As the Secretary-General has clearly explained, the crisis is escalating. The violence is getting worse. The abuses are continuing. The country is becoming more polarized and more radicalized. And Syria’s immediate neighbors are increasingly worried about the threat of spillover. “Nine days ago, I met President Assad in Damascus. I told him that the six-point plan is not being implemented, as it must. I strongly urged him to take bold and visible steps to now radically change his military posture and honor his commitments to the six-point plan. I urged him to make a strategic decision to change his path. I also made clear that his Government must work with my mediation effort on behalf of both Organizations that I represent. “President Assad believed the main obstacle was the actions of militants. Clearly, all parties must cease violence. But equally clearly, the first responsibility lies with the Government. “Since then, shelling of cities has intensified. Government-backed militia seem to have free rein with appalling consequences. Yes, some detainees have been released, and agreement has been reached on modalities for humanitarian assistance. But the hour demands much more. And President Assad has not indicated a change of course in his recent address to the National Assembly. 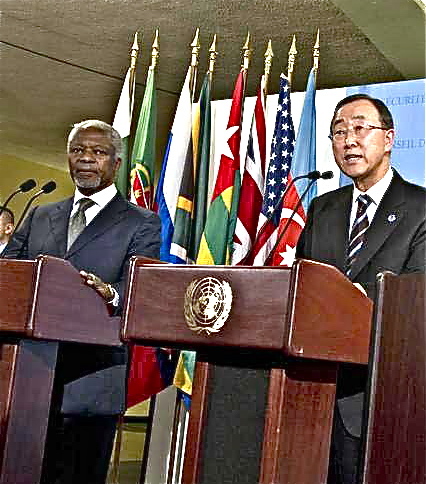 “The Annan plan remains at the center of our efforts. We continue to support it. “At the same time, in view of the deteriorating situation I would welcome further international discussions on the way forward. “The upcoming G20 Summit in Los Cabos, Mexico, is an important opportunity. I will be there and I expect key stakeholders to take advantage of this gathering to discuss the crisis in its full depth and breadth. “No one can predict how the situation in Syria will evolve. We must be prepared for any eventuality; we must be ready to respond to many possible scenarios. “At the request of the Security Council, I will soon present a variety of options for the way ahead. “…I said that if this plan is not working or if we decide it is not the way to go, we should be looking at options. But as long as we all agree that the plan has merit, the question is: How do you get the Syrian Government to perform, to implement it, even at this late hour? This is what the Council is in the process of discussing, and I am not going to do their work. “…There are discussions going on about the possibility of establishing such a group. And the group would include countries with real influence on the situation, countries that can influence either side, the Government of Syria and the opposition… This is why the contact group, that you cannot resolve it by just focusing on the players inside, you need to have the regional and international players be involved. They have to be part of the solution. "To maintain the momentum for a political solution to the Syrian question and to avoid the escalation of crisis, the parties concerned inside Syria should immediately implement the relevant Security Council resolutions and the six-point Annan plan."